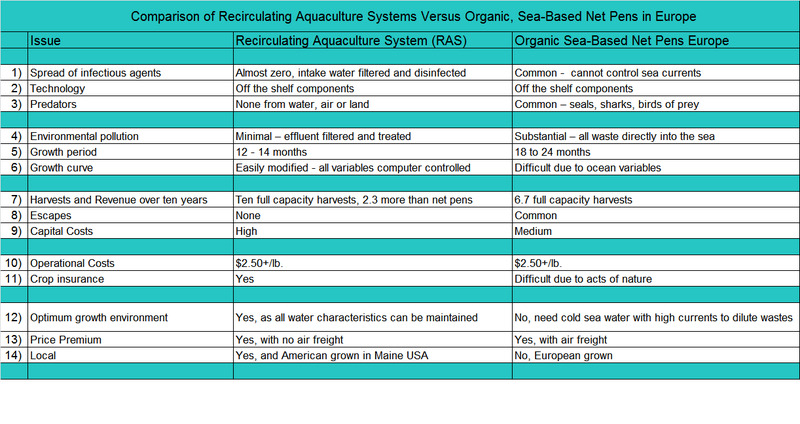 With unique, recirculating aquaculture system design and permits, Palom's (RAS) will produce sweet tasting North Atlantic Salmon. Full traceability gives the skeptical consumer piece-of-mind. 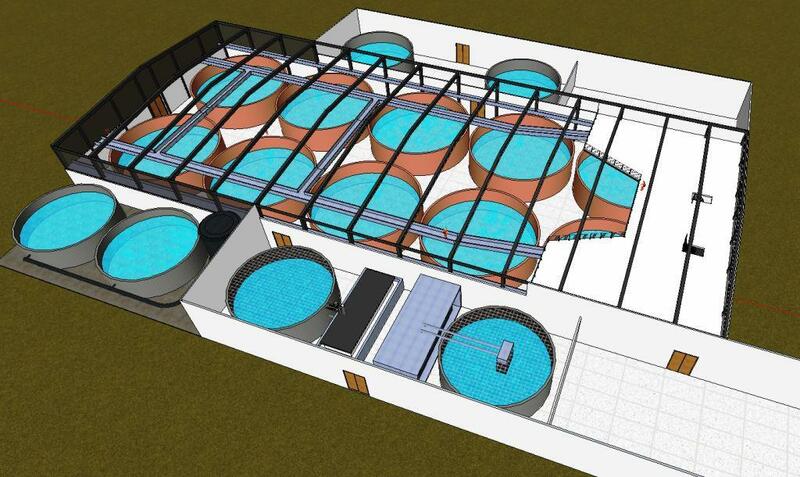 Even the best recirculating aquaculture system design requires a great site. "We are ready.” All the key permits are current. We also negotiated the maximum pollution allowable in our effluent, allowing Palom design and operational flexibility. We underwrote our Maine EPA Discharge Permit, and Army Corps Permit assuming a 10% flow-through rate but created the farm for less than 5% discharge. Here is a satellite view of the site in Gouldsboro, Maine. 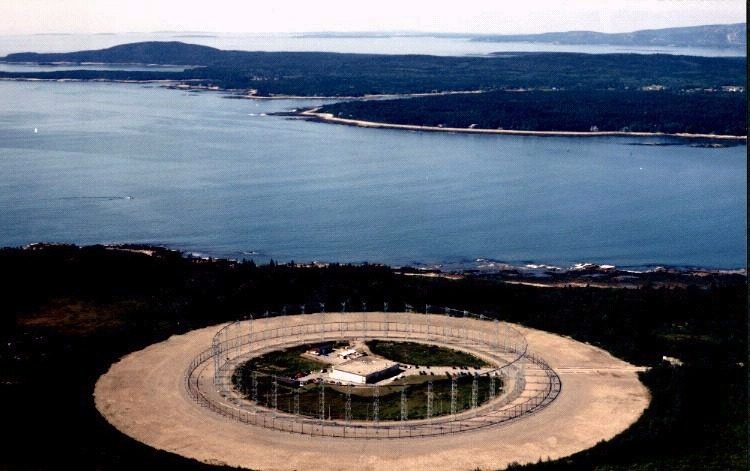 The site was a former US Navy antenna station and resembles a “bulls-eye” from space. Palom is the first company to be awarded such a permit in the United States. (Above) Recirculating aquaculture system design replaces Naval Engineering - The first picture from the air shows the complete Gulf of Maine Aquaculture Business Park. The red arrow indicates the location of Palom within the Park. The Park's driveway enters into Corea Road. To the left of the red arrow sits Prospect Harbor, the source of our seawater. To the right of the red arrow is the Village of Corea. The Park is 40 acres or 16 hectares. The second picture above shows the ring of crushed rock creating the surface of the farm site. This circle was a former Naval antenna array decommissioned in the late 1990's. The red highlights the footprint of the first of two farms. The diameter of the circle is about 330 meters or about 1,000 feet. Units of measure above in feet. (Above) Southeast Side of Farm - As the farm engineering is modular, we depict 10 tanks above. A five tank system would be the minimum size which makes economic sense. 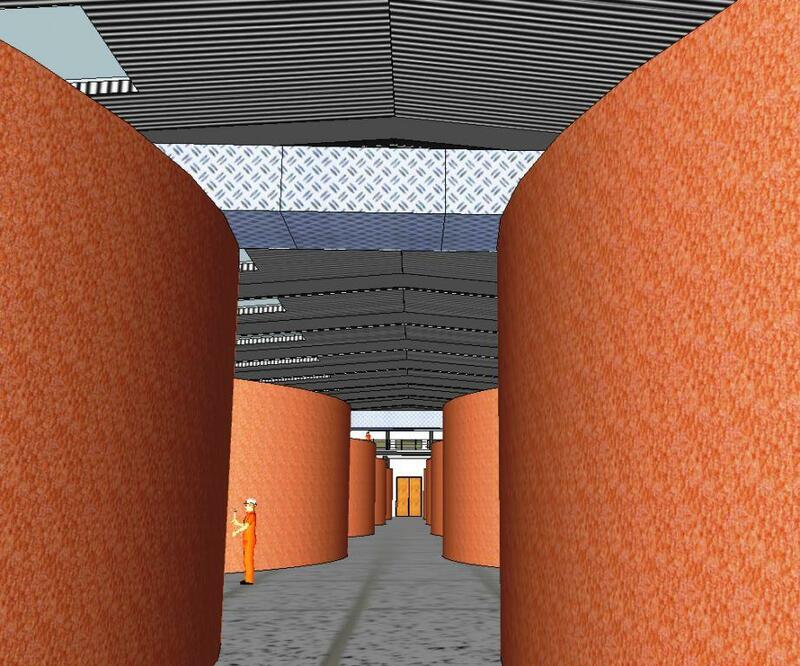 This minimum closed containment system would produce about 600 metric tons of market weight North Atlantic Salmon. (Above) Aerial View - Land based RAS are very similar with regard to engineering. However, each farm must design for its specific location and species. In this depiction, smolt would enter from the right and move to the left as they mature. Brown represents the growing tanks where gray shows harvesting tanks. A mezzanine and flyover allow easy viewing access of the fish. Notice the separate mechanical room housing the biofilters, mechanical filters and the Co2 degassing equipment. The dark black equipment is the location of the incoming raw sea water. (Above) View From Mezzanine - Continuous actual monitoring of the fish allows staff to develop a keen eye for abnormal behavior as computer monitors are quite limiting. With the complete closed containment protected from the weather, there is no excuse for "not making the rounds". As wonderful as motion sensor cameras are, we believe that the human element can never be substituted. (Above) Inside the farm next to the harvesting tanks.Mezzanine is off in the distance. Trucks would pick up harvested fish in this area. View from driveway looking northeast. (Above) South westerly view of the park with Prospect Harbor in the background. 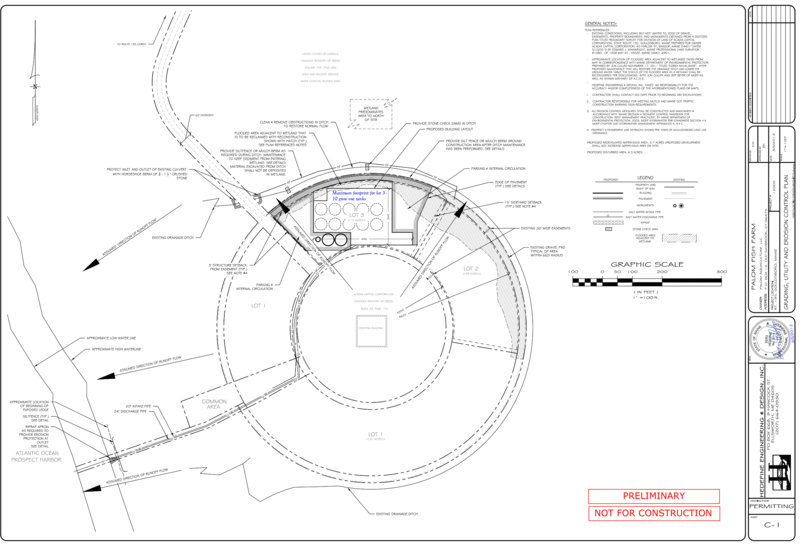 Palom will develop the center, Building 85, and the half of the circle closest to the viewer, lots 2 and 3. The half of the circle closest to the sea will be covered with a solar array for electricity. The formal name of the circular antenna array is the Wullenweber Circularly Disposed Antenna Array (CDAA). Many called it the "elephant cage". In the pre-satellite age, the military used this configuration to triangulate radio signals for radio navigation, intelligence gathering and for search-and-rescue. The Navy decommissioned the base in 2000. Locals remember that the Navy needed the base quickly built in the early 1960's. For one full year, the navy contracted with local quarries for crushed rock to be dumped onto the bog, truckload after truckload. The shear weight of 6 meters of stone compacted the bog down to the region's pink granite creating a stable base on which to build. Palom Aquaculture will grow an organic, sweet tasting, North Atlantic Salmon, using a recirculating aquaculture system (RAS) and the cold, clean waters of coastal Maine. Our aquaculture future must include Recirculating Aquaculture System (RAS) farmers, like Palom Aquaculture, sustainably growing, a pure, great tasting salmon. Sustainable aquaculture, incorporates the welfare of the farmer, the fish and the community. Traceability and profitability give comfort to the consumer as to product quality and longevity. Sustainable return on investment? Yes, Palom Aquaculture must protect investor capital, the local community and the local environment. Aquaculture Innovation – Palom’s source of inspiration is mother nature. 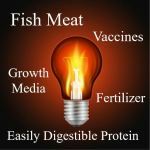 Using RAS, Palom will sustainably produce great tasting salmon, pure fish protein and ethically harvested blood serum. Copyrighted by Palom Aquaculture LLC, Gouldsboro Maine USA .